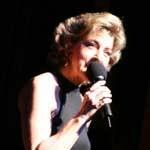 Local jazz vocalist, Kelly Crum Delaveris, brings her trio to the Worthington Inn this Saturday night starting at 7pm. Kelly Crum Delaveris has been a regular on the central Ohio music scene since she graduated from Upper Arlington High School. Her early music education came from her father’s record collection, containing Ella Fitzgerald, Sarah Vaughan, Anita O’Day, and Carmen MacRae. An extraordinary singer, Kelly has performed with the Columbus Jazz Orchestra, the Columbus Symphony Orchestra, and as the opening act for Tony Bennett, Joan Rivers, Sarah Vaughan and Buddy DeFranco. Kelly has opened for the likes of Sarah Vaughn, Bob James, Bob Newhart, Joan Rivers, Tito Puente, Tony Bennett and many more. She was voted best vocalist in Columbus by the Columbus Dispatch 2006 Readers Poll. Kelly also performs regularly with her own group, Brasileira, and has a passion for Brazilian music – specifically music from the Bossa Nova era – late 1950s-1970s.